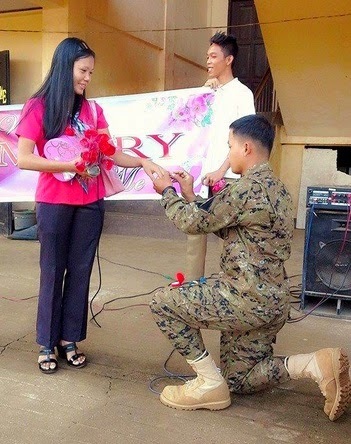 A video of wedding proposal of Filipino soldier to his girlfriend, teacher in Can-Avid, Eastern Samar went viral recently. Avila was speechless but she's so happy as Padayogdog kneeled down to offer the engagement ring. In an almost 8-minute video, it can be seen that some students and teachers already knew what will happen in that morning. The video which was uploaded last September 25 already garnered around 600,000 views and was shared by 28,000 times already. Post by Gerry Gaspar Palada Padayogdog.